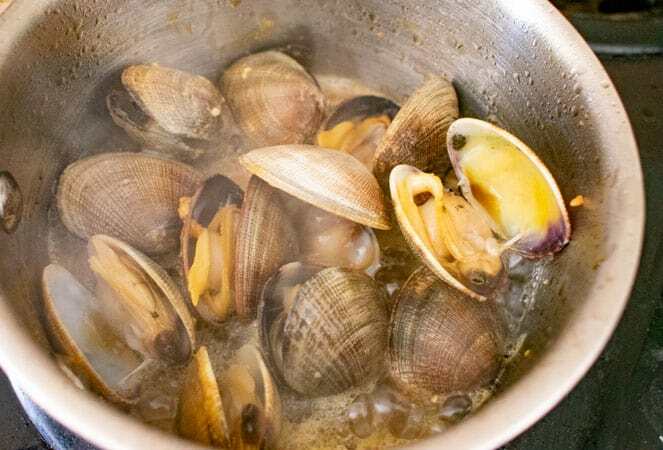 The standard preparation of clams in a Western kitchen usually contains any combination of white wine, garlic, parsley, butter and lemon. That tastes great, but let’s try something different. 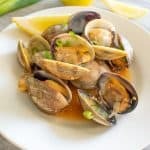 Manila clams are originally from Japan, but some of them somehow ended up on a boat to the west coast of the US and Canada where they have been farmed ever since. They are prized for their sweet flavor, long shelf-life, and for meat that easily separates from the shell after cooking. Manila clams taste best in the winter months when their meat is the most robust. With warmer summer temperatures, they put their effort into reproduction. As such, their ability to stay closed via their abductor muscle is not as strong as the winter months. The only downside to clams is that their 1) cost and 2) cleanliness. For whatever price you pay per pound, most of that weight is from an unedible shell. You don’t get much meat for your buck. They can contain sand and grit inside their little shell. You have to soak them in salted water beforehand. Otherwise, drain the cooking liquor before serving to remove any grit. Q: What kind of Miso should you use? A: The one you have in your house. There are several types of miso, ranging from white to yellow to red. They each vary with sweetness and saltiness. However, use the variety of miso that you already have. Yes the flavor will vary slightly, but it’s nothing life threatening. Once you get your clams home, remove any cracked or broken shells. Similarly, if there are any open clams that don’t close when touched, they are dead and should be discarded. Wash and cover the remaining clams with water and salt to remove any grit. Soak for 20 minutes to an hour. Remove from water. While waiting for your clams, gather and prepare the remaining ingredients. Slice green onion, lemon wedges, and measure out the miso and mirin. Heat a pan over medium heat and add the clams miso and mirin. No oil is required. 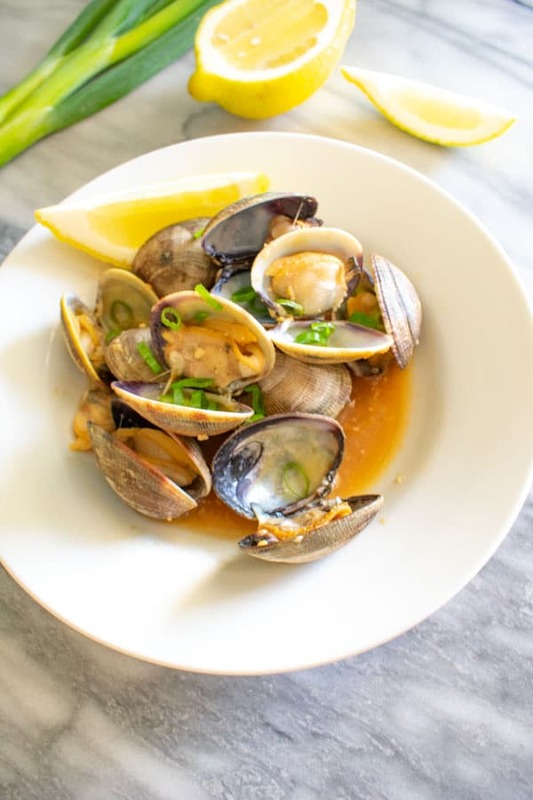 The clams will leach their juices and a sauce will be made with the miso and mirin. Stir over medium heat until the clams have all opened. How open do they need to be? Well, they should be open. If not open at all, they are dead and should be discarded before serving. They should be open at least 1 inch. If they are wide open, as in completely stretched out to 180 degrees, you run the risk of the meat separating from the shell. You end up serving empty shells and looking for that little piece of meat, which may have shrunk to oblivion. Discard any unopen shells. 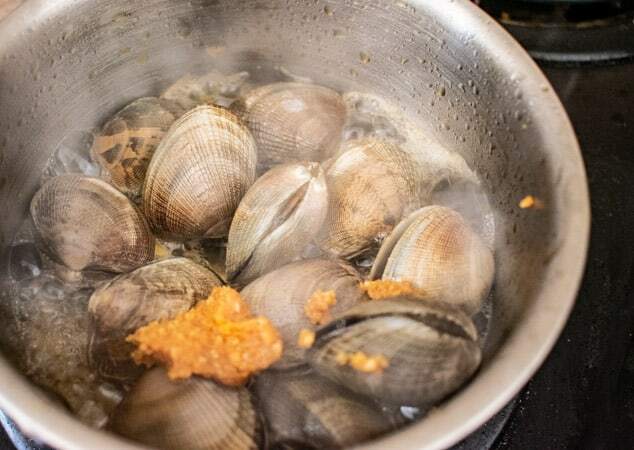 If you have not pre-soaked the clams, strain the liquid or tilt the pan and spoon out the sauce so you don’t pick up any heavy grit that will have settled to the bottom of the pan. Garnish with sliced green onion and a lemon wedge if you prefer. 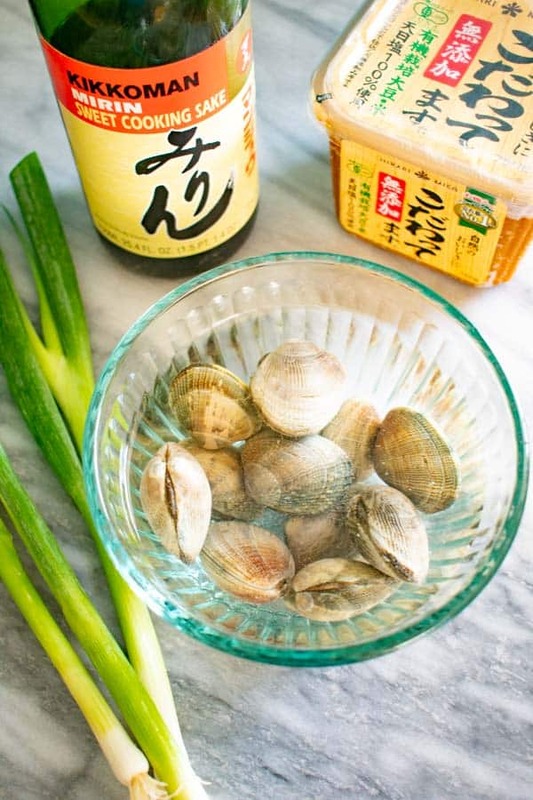 Try these dairy-free clams with some beer. The saltiness from them would work well served with raw vegetable sticks or as a bar snack with cold beer. 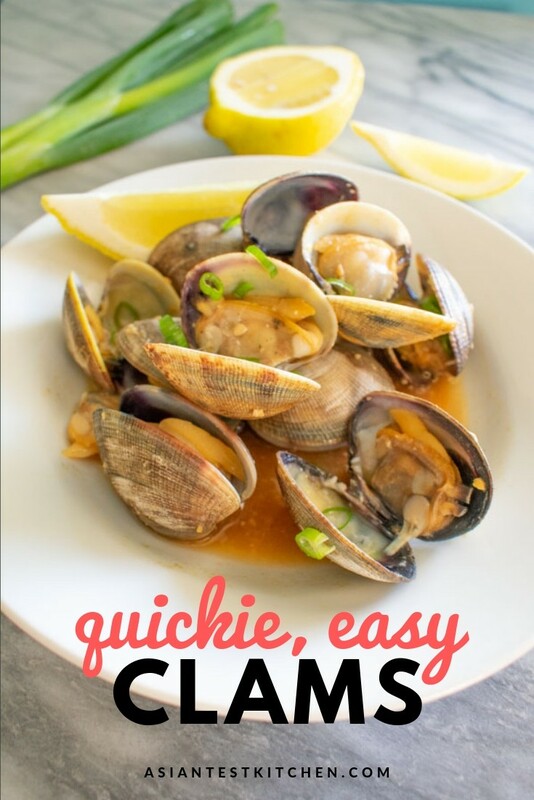 When you don't have a lot of time, clams are a dinner savior. Simply stir fry these little guys with a little Japanese miso paste and sweet mirin. Cover clams with cold water and 1 tsp salt. Let sit in the fridge for 20 minutes to 1 hour to remove any excess grit in the clams. Discard any cracked clams or open clams that do not close when touched. Heat a saucepan or medium heat. Add clams miso paste and mirin. Cook while stirring to distribute miso and mirin until clams are open. This should take less than 5 minutes depending on how hot your pan is. 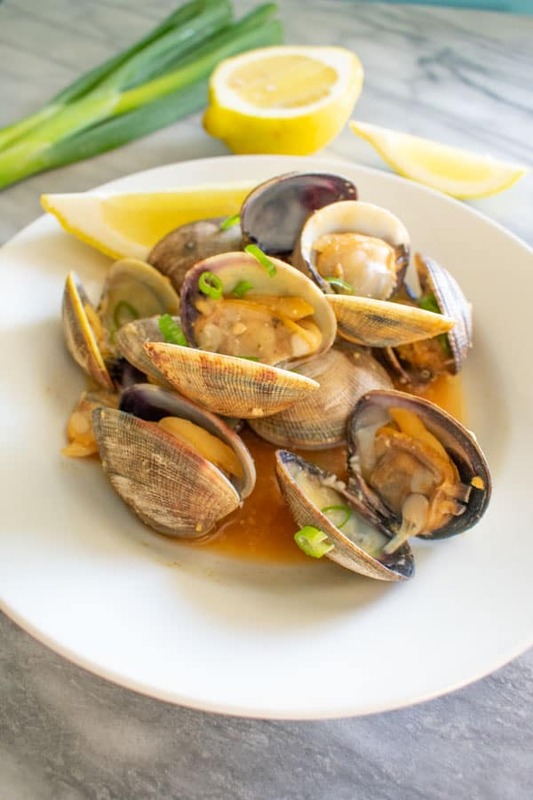 Serve clams on a plate and garnish with green onion and lemon wedges. Do you like chomping on clams? Please spread the Asian ♥ and share!